Before we get into the return part of the trip, I did find a couple of pictures off of Pam’s phone from Big Bend that were great. Typically we don’t take pictures of the more “interesting” places during a drive due to our attention on the road. However, Pam snapped this one on the road to the hot springs, where it was a one-lane road, and given the wider wheel base of the Roamer, it didn’t leave much room for error. 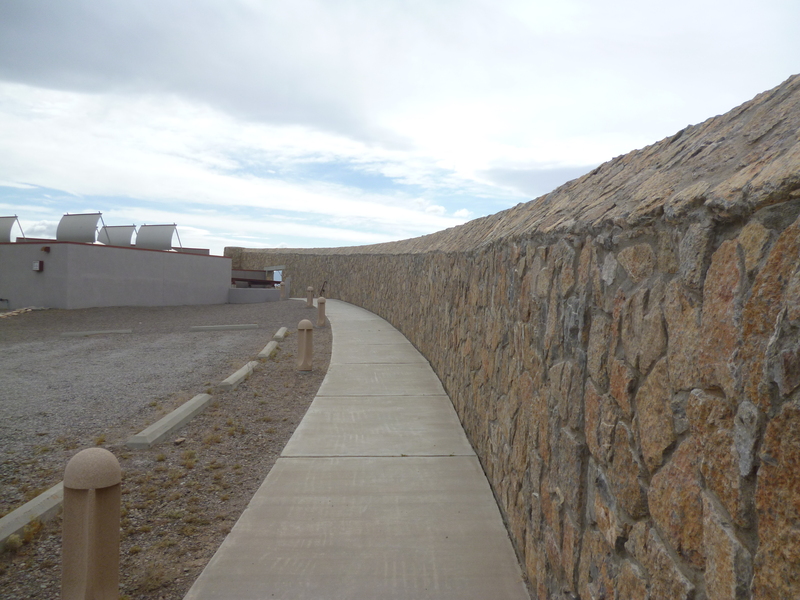 The one-lane the other way is tucked against the rock wall on the other side. What a blast to drive. 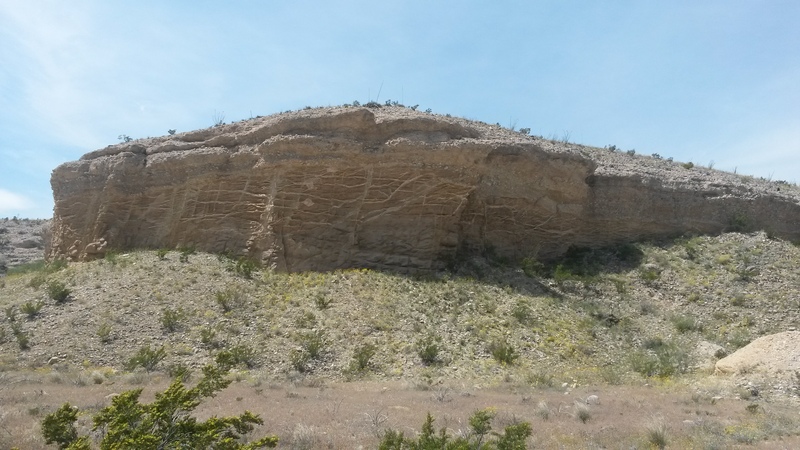 The second picture was of a very unique rock wall where the softer rock had eroded away around the veins of harder rock to form the marbling seen in the wall. Now back to Austin and our trip home. 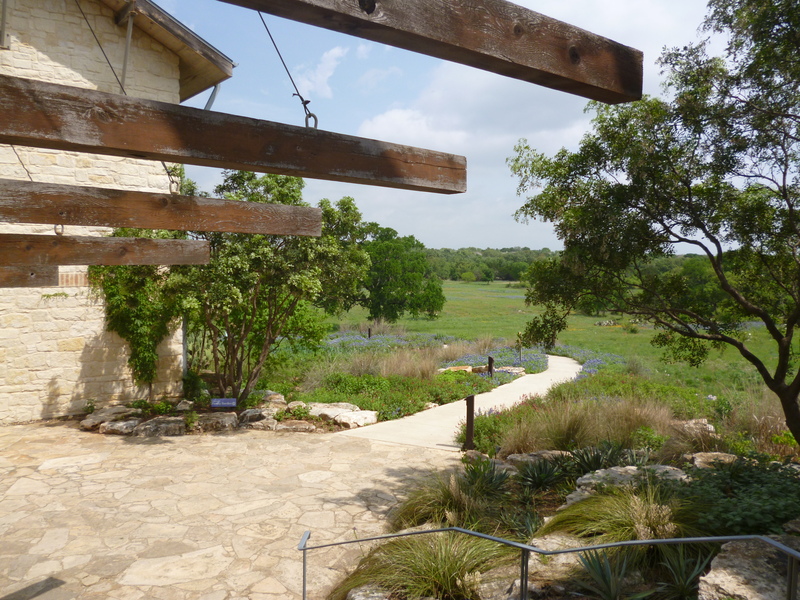 We headed into Austin from our campsite to see the wildflower center and grab some good Texas BBQ. 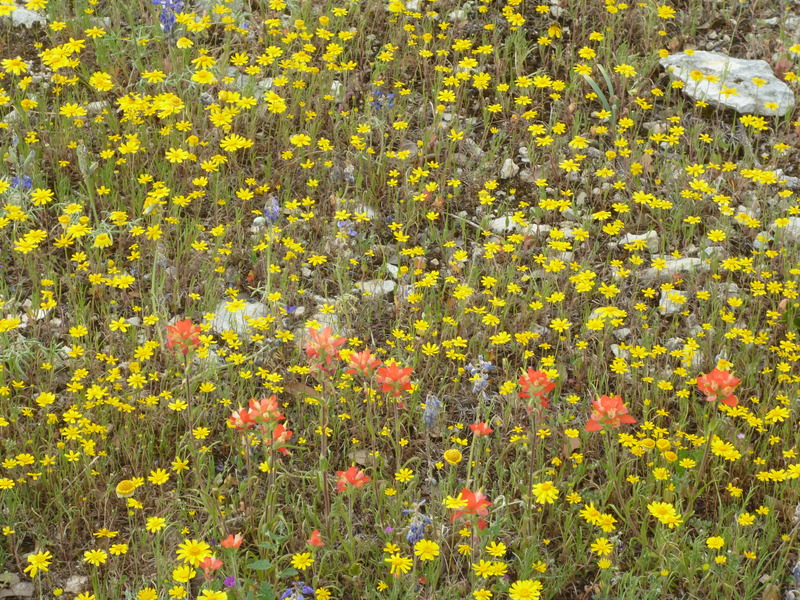 It should be said that the flowers along all the roads and in the Texas fields during our trip there and back were gorgeous, best in years folks told us. The Lady Bird center was nice, but a little bit of a letdown. 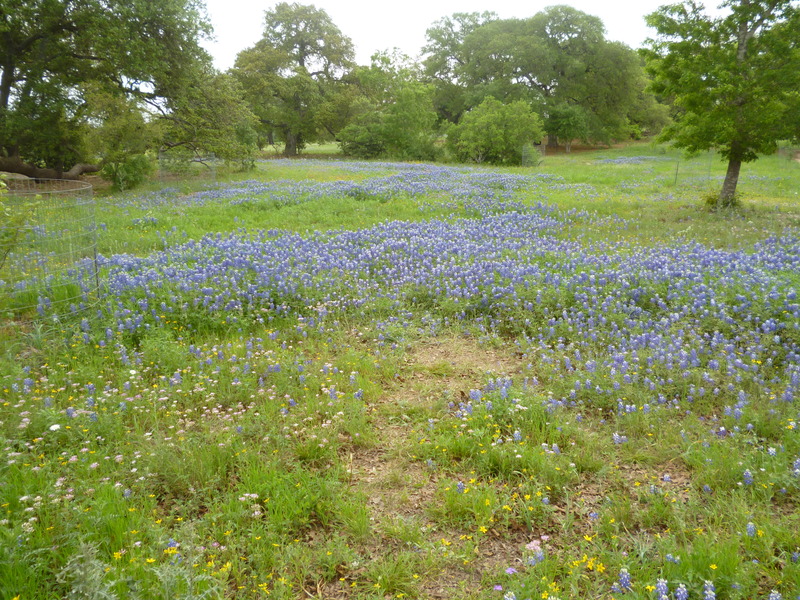 Based on what we saw on the roads, I expected huge lawns of the Texas flowers in all their colors for us to see. It was more of a botanical garden with large open fields and a visitor center to help us identify all the flowers we had been seeing on our trip. The facility buildings were beautiful stone, metal and wood structures and still a very nice place to visit. They were getting set up for the yearly sale of plants and the place was buzzing. We looked up a Diners, Drive-in and Dive BBQ place in Austin called The Green Mesquite. The place looked like a classic throw-back with an outside patio area that also hosted local bands there most nights. 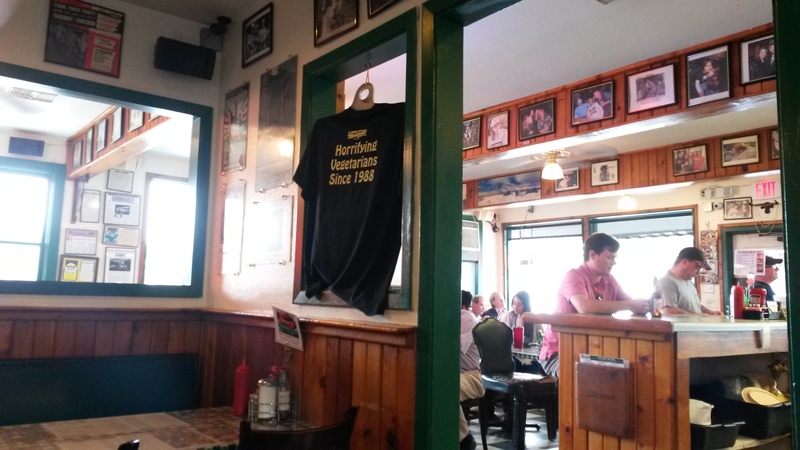 Their T-shirt “horrifying vegetarians since 1988” said it all. We sampled every meat option they served between the both of us. It was good, but a recent find in Phoenix called Little Miss BBQ left us wishing for Arizona BBQ. 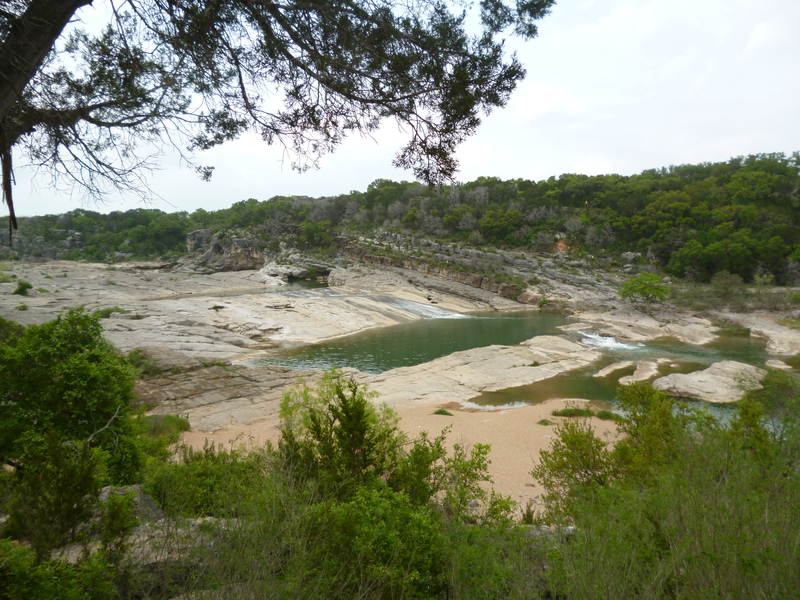 We hiked the falls at Pedernales Falls State Park. The water was pretty low, where at times it can be a wall of water cascading over the rocks following a hard rain. It rained the day of our departure, but we did stop a few places along the way. 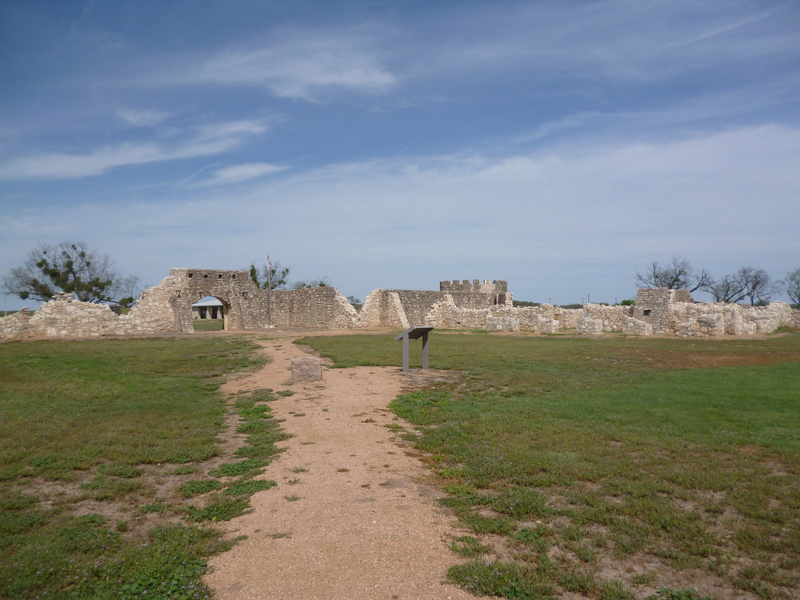 First, was one of the frontier Spanish forts near Menard, TX, the Presidio San Saba along the San Saba river. The Spanish outpost was constructed and abandoned in the mid 1700s. Another stop was for lunch as we entered the oil fields of west Texas. The lonesome roads out there are all pick-ups and oil trucks running from one far flung site to another. Most of the little towns in the area were made up of RV lots for the oil rig worker’s 5th wheels. 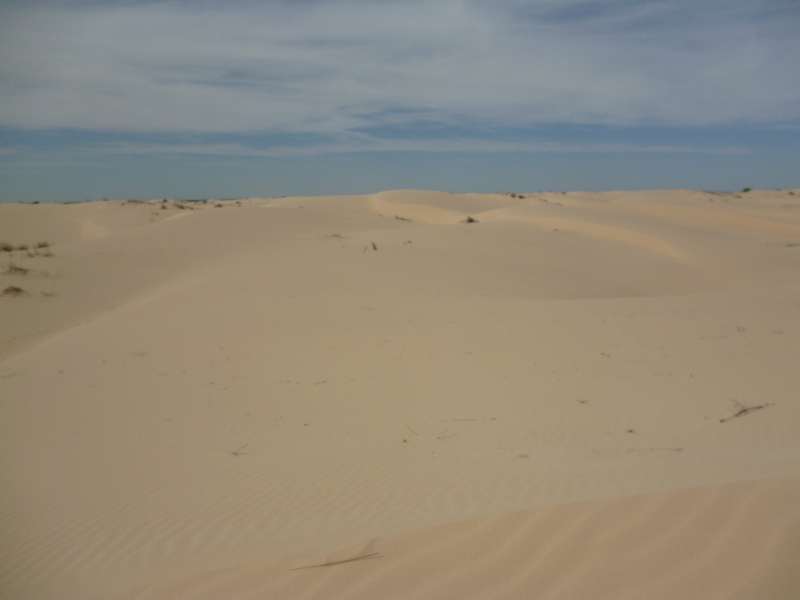 Our next campsite was at Monahans Sandhills State Park. 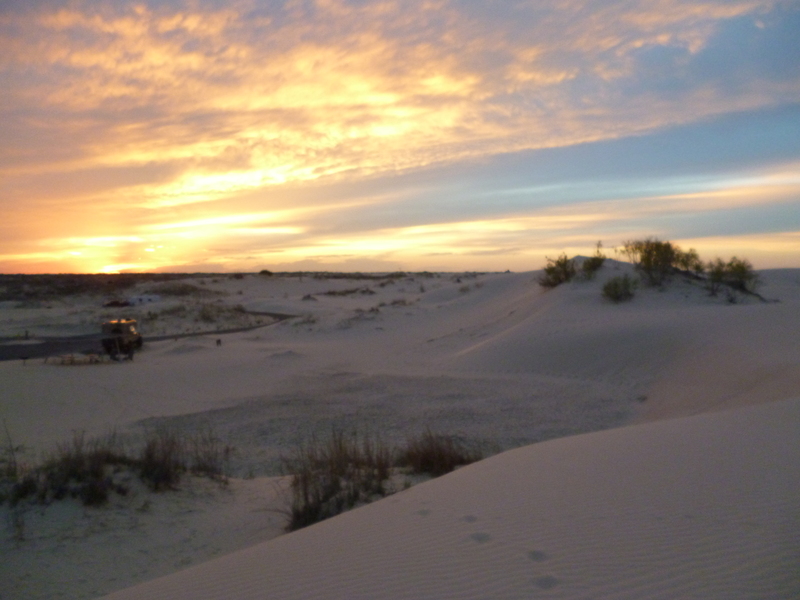 The rich, dark soil of the Austin hill country transitioned into sandier soil as we moved west until the vegetation was nearly gone at the sandhills. They were beautiful. 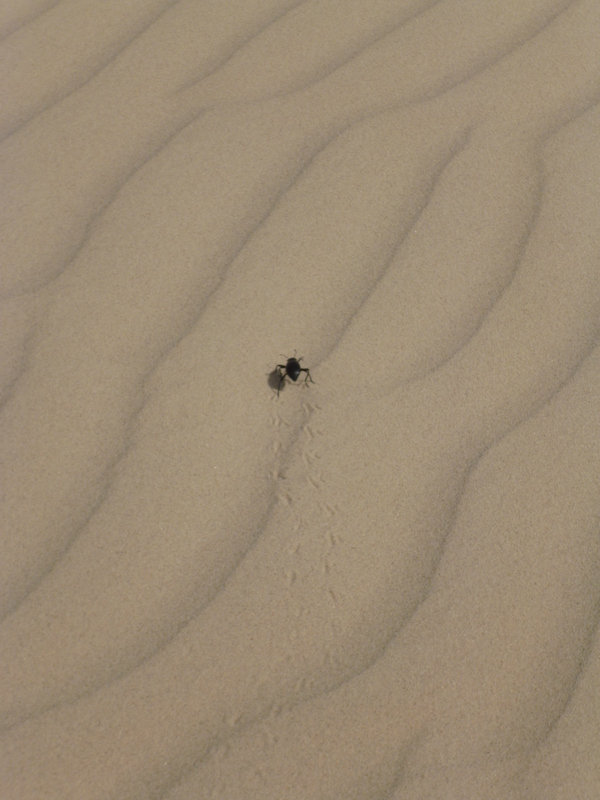 What was most interesting was hiking the dunes in the morning and seeing all of the tracks in the sand from the many creatures that traverse the dunes at night. The sunsets there were also spectacular. We met some new fellow travelers at the park that also have a travel blog at http://www.metamorphosisroad.blogspot.com. They have been on the road for a couple of years now. Pam and I are still new-comers to this adventure lifestyle. They travel with their cat, which is something we have been considering. Pam felt a little homesick for Peanut after our nice visit with Hans and Lisa, and their travel cat Rosie. 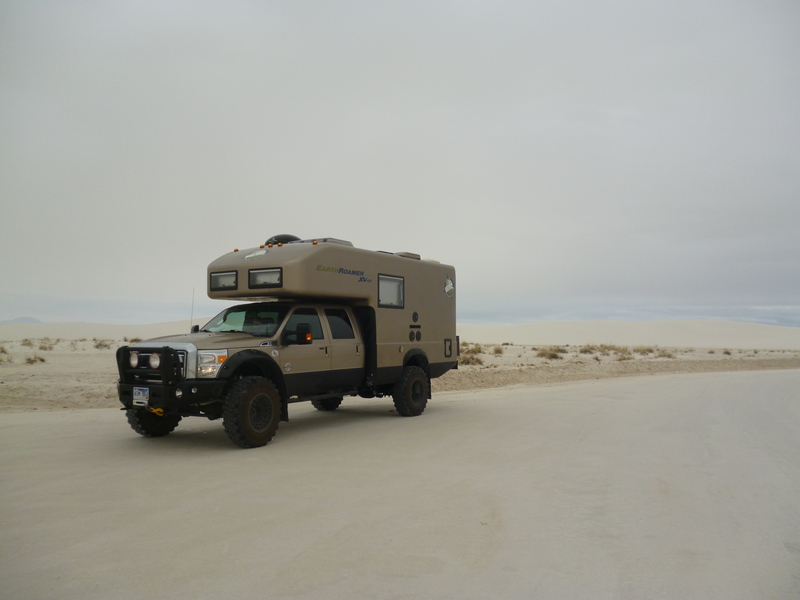 Given our new mobile life, what we haven’t figured out yet is the optimum travel mode for the road: expedition vehicle, truck and 5th wheel or class A motor home with a car in tow. We’ll keep the Roamer for now. 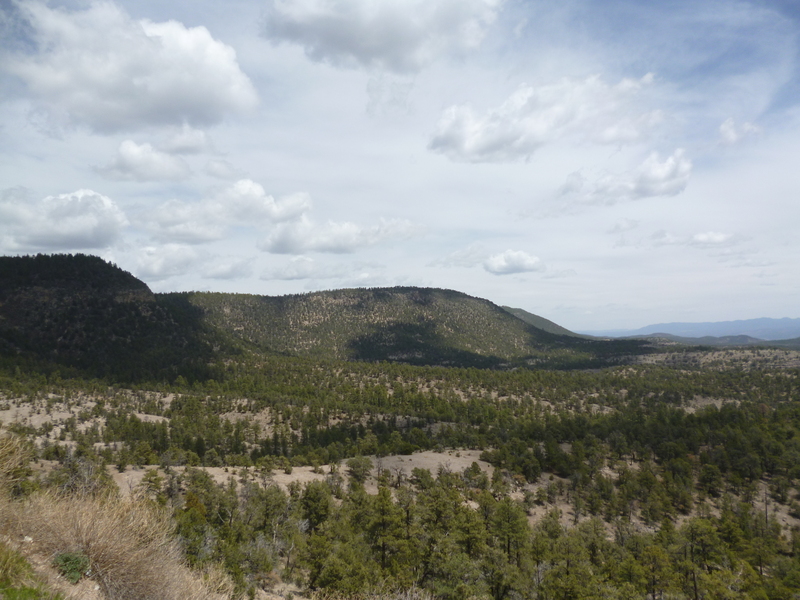 We left the dunes with the objective to make it to the City of Rocks State Park in New Mexico the back way through Cloudcroft, NM at 9,260 feet before dropping down into the desert basin near Alamogordo. We stopped at White Sands National Monument since we passed right by it along this route. 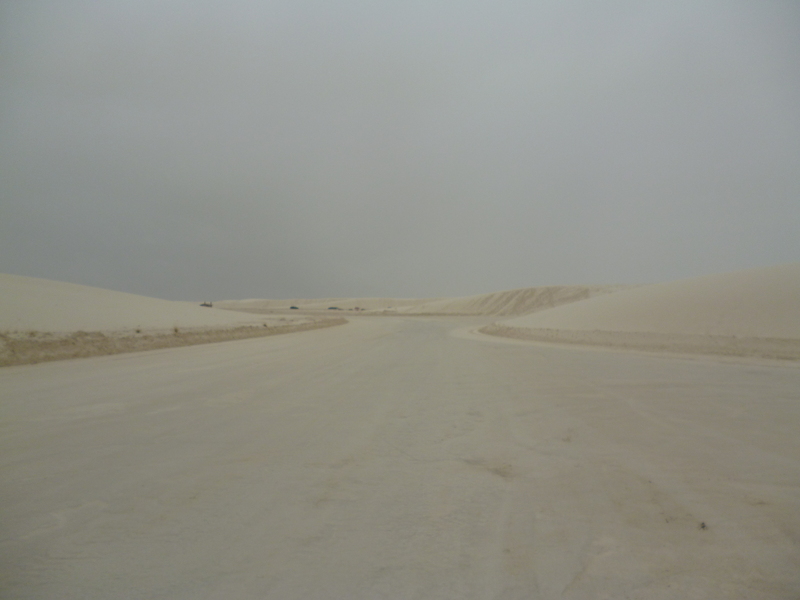 It was raining again, but the white gypsum dunes were very beautiful even in the rare, overcast and rainy weather for the area. We drove the loop into the dunes, but no hikes this time. We’ll have to go back. It’s too bad they don’t have car campsites there, just back country tent sites. It almost makes me want to break out the tent again – almost. 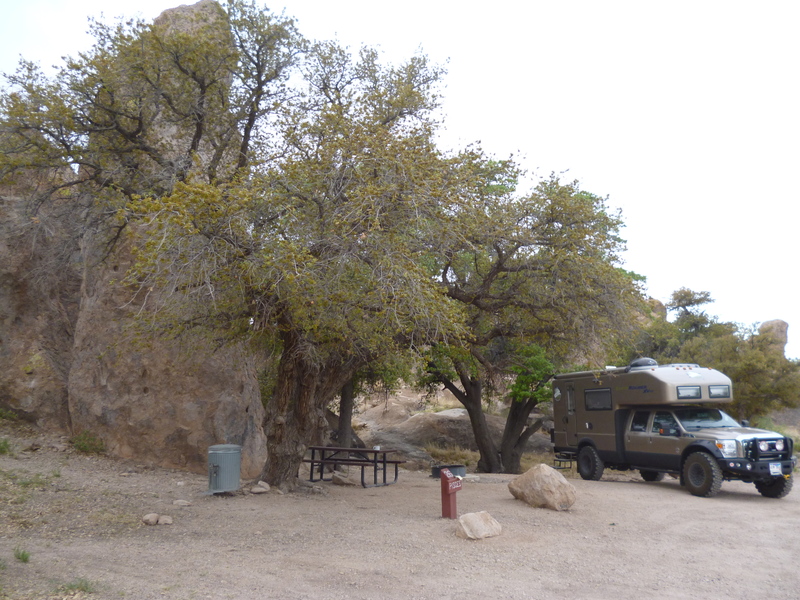 We then stopped in Las Cruces for dinner at a good Mexican place, Andele’s Dog House, before arriving at the City of Rocks State Park in pure darkness just prior to them shutting the gate for the night. 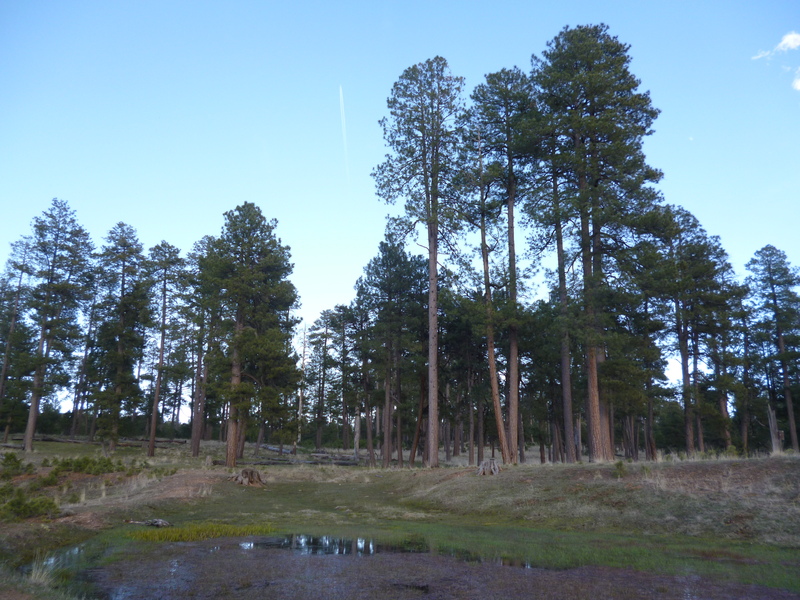 If you have never been to the park, finding your campsite can be tough in the daylight, but finding one of the few remaining open sites in the moonless night was an experience. Pam broke out the flashlight and we slowly made our way around the park looking for the elusive spot. After nearly circling the place, we stumbled upon a site that was marked as taken with no one there. It turned out it was a day use ticket so they had just left the park prior to our arrival – we got lucky. When we woke up the next morning we realized how lucky we were. The sight was very nice, and now we understand why folks talk so highly of this place. 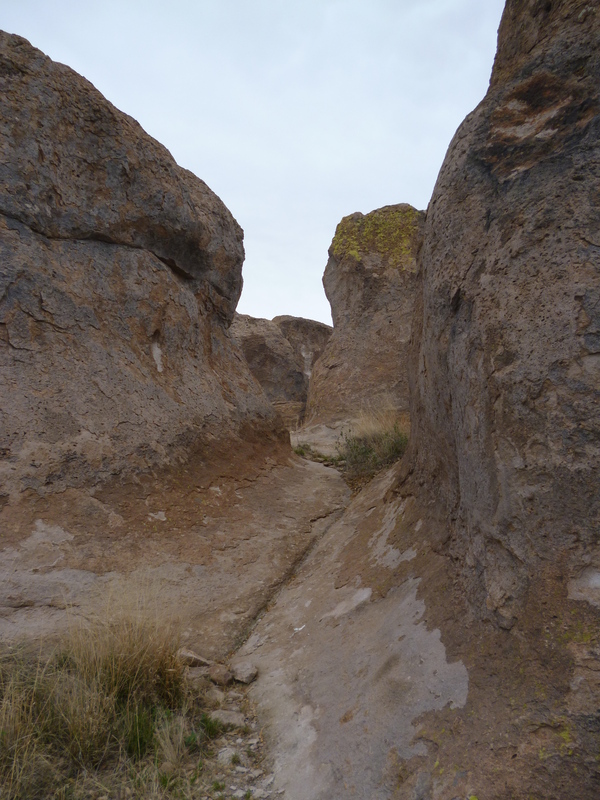 We hiked around the rocks a little and then drove around the park again in the daylight to see what we thought we saw the previous night, and to mark campsites for future trips. The visitor center there was a neat building. I’m thinking I need another building project. 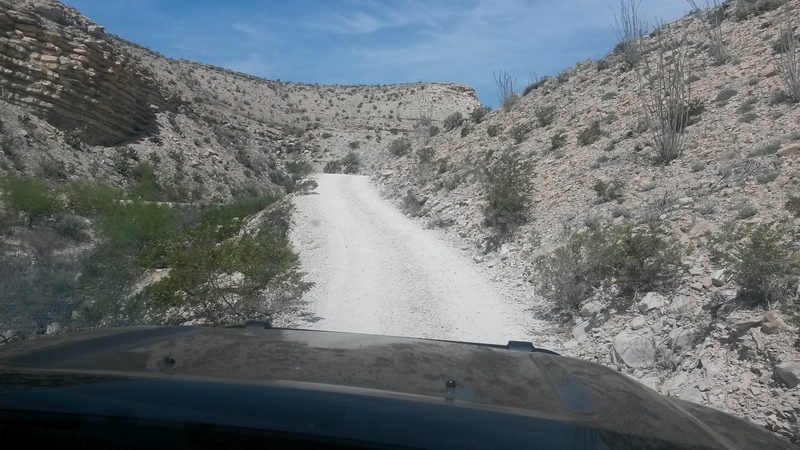 We’re always looking for new roads in and out of Arizona to make our trips more enjoyable. 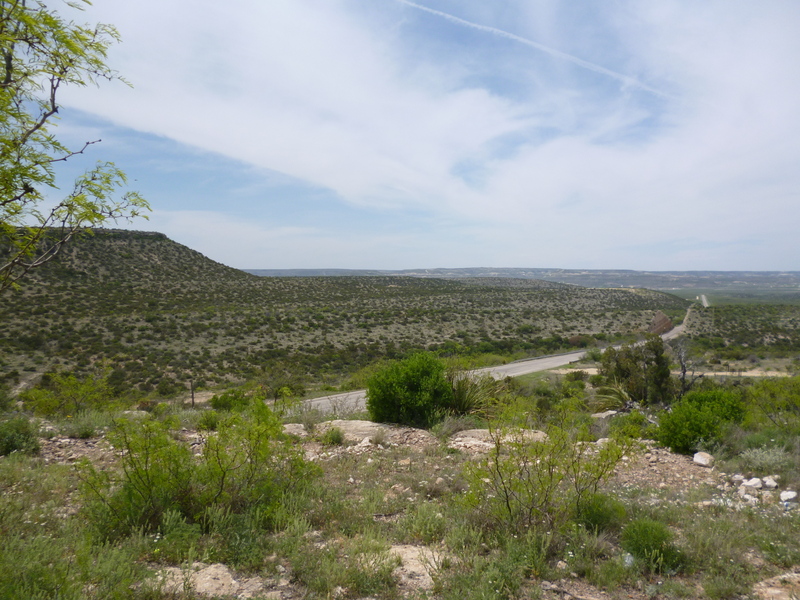 We left the state on a dirt road near Portal, AZ into New Mexico and re-entered Arizona from New Mexico along route 180 to Eager. This was a pretty drive marked with the Rand McNally map green dots, given to picturesque roads. We’ve now traveled on many of the green dot roads. Take these roads, they are not the fastest way to a destination, but possibly the most beautiful. We arrived at our place on the Rim to check up on things (nothing broken or in need of repair – oh yeah) before dropping back down into the valley. The pond was full and forest looked lush, even with the lower than average snowfall this year. I guess the additional winter rain may have made up for the snow. An early Monsoon season would be good too. Our next trip will be into Utah in May….